The Saddle cemented their place at the top of the Bathrooms Solutions Blackpool and Fylde Sunday Alliance as Bradley Gill’s four goals helped them to a 7-0 win at Kingsfield. Marco Cobb, Jackson Hulme and Robbie Hulme also scored for the premier division leaders. Ben Seear scored four too, all in the second half as Blackhurst Budd continue their perfect season with a 9-1 win against Appletree Finance. Nick Greenall grabbed a hat-trick, while Michael Shorrock and Danny Morris also scored. Luke Robinson grabbed a late consolation from the penalty spot. Ashley Robinson scored a brace as Additions won 4-1 at A &P Autos. Simon Beavers and Scott Bradford completed the scoring and Dax Hoogerwerf replied. Matt Nelson and David Ramsden scored a brace apiece as Exceptional Kitchens won 5-1 at Eurotech, Tim Slater getting the other. Goals by Phillipson Peltier(2) and Matthew Jones sealed 21st Century Windows’ 3-0 win against AFC Rangers. Shovels extended their lead at the top of division one as goals from Paul Gaskell(2), Ross Jones and Daniel McGovern secured a 4-0 win against Wesham. Athletico Tijuana were left perplexed as they let a 5-1 lead slip against AFC Lane Ends Blackpool to draw 5-5. Aaron Fleming scored a brace, and Athletico’s others came from AJ Greenwood, Ryan Thomson and Rick Horrocks. Jordan Dundavan scored a hat-trick for AFC, with and Ashley Casey and Matty Grime also on target. Giovanni Tamburello netted for Anchorsholme in their 1-1 draw with Chris Allen Garages, for whom Adam Fisher scored. Highfield made it back to back wins with a field Brewhouse. Scott Anderson scored a brace, with Daniel Brown, Ross Duckworth and Jordan Wood also on target for the winners, ensuring that Ben Perry-Acton’s hat-trick was in vain. Sam Bannister scored three in a winning cause as goals by Daniel Ball, Neil Gore and Tom Young sealed Jewsons Blackpool’s 6-3 win over Belle Vue. Joe Caton, Andrew Duckworth and Ahern Playforth replied. Stephen Whitehead scored two and Liam Dowell the other as The New Albert pipped Highfield Social 3-2, with Jamie Morris and Andrew Willacy replying . The lead continues to change on a weekly basis in division two. FC Albion are on top this week after goals from Reece Hughes (2), Jordan Bullen, Joe Cornall, Michael Crossland and Nitisat Sirisom sealed a 7-1 win against Highlands, for whom Brandon Prestwich replied. The game of the day between former leaders BES Utilities and third-placed Links ended 2-2. Lee Grundy and Danny Hadgraft scored for BES, Conah Bishop and Liam Whitehead for Links. 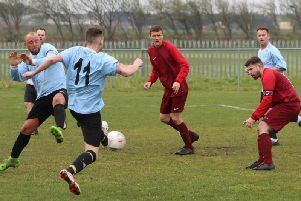 Broomheads Estate Agency maintained their 100 per cent record as Kenny Cram, Caiden Callaghan and Callum Chadderton sealed a 3-0 win over Up-Rite Scaffolding. Westview’s good run continued with a 6-3 win over The George as Jonathan Gough hit a hat-trick. Further goals came from James Abram, Niall Valentine and Thomas Whittaker, while Eddie Burke, Billy Leahy and Daniel Rapley replied. Lane Ends (Harry Gornall, Andrew Kozlowski, David Smith, Steven Turner) drew 4-4 with King Edward (Conagh Bootle, Rob Heritage, Anthony Power, Sean Willetts), and finally goals from Stuart Hammond and Gareth Leadbetter earned Marshall Court a 2-2 draw with Metrostars, for whom Mark Bray and Carl Hughes replied. Blackpool Wren Rovers got their 2017 off to the perfect start with a 4-0 home win against Coppull United in the West Lancashire League premier division. Carl Eastwood handed them the lead after 11 minutes but they had to wait until the 50th minute for Gary Pett to extend the lead with the first of his two. In the final 10 minutes, goals by Nick Greenall and Pett added gloss to their win. It means Wrens remain in second place behind Longridge Town, whose game at Sloane with Hest was among the weekend’s postponements. Rovers are now seven points behind with a game in hand. Garstang went down 2-1 at Hesketh Bank despite taking the lead in the first minute through Alex Colquhoun. But Richie Burns equalised for midway through the first period before Bob Milton scored the winner early in the second half. Garstang remain in sixth place but have played four games fewer than the majority of sides above them. Thornton Cleveleys slipped to a disappointing 3-1 defeat at home to Vickerstown. The visitors raced into an early lead through Danny Keenan but had to wait for the second half to add a Jordan Dix goal and Keenan’s second. Adam Challoner bagged a late consolation for Thornton from the penalty spot but the hosts drop down to 10th. Leaders Poulton weren’t in league action in division one and saw their advantage cut to one point after Haslingden St Mary’s beat Wyre Villa 6-2. The hosts raced into a 2-0 lead through Sean Pearson and Tom Hulme but Villa hit back immediately with a Jarred Bain goal. That’s how it looked like remaining until the final 10 minutes saw a flurry of late goals. Hulme grabbed two more to secure his hat-trick, while Michael Saunders and Michael Robinson also struck to make it six after Ash Bradshawnetted Villa’s second. Haslingden are perfectly placed for a title challenge as they still have three games in hand on Poulton. Mid-table Lytham Town were another club without a game.